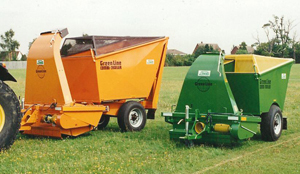 The Greenline Combi-Trailer system covers a number of functions, of which the high tip trailer is the central unit. - Flail mower, Shredder, Wood Chipper, Waste handling equipment. - Scarifying, Cutting of long and short grass, Collecting leaves, twigs and rubbish as well as hedge cuttings. - Shredding of branches, spruce, fir bush cuttings and scrap wood. - Cutting of trunk and logs. Sports Grounds - Golf Courses - Cemeteries - Municipal Services - Park and forest - Authorities - Large Estates - Recreation Grounds - Apartments and Condominiums - Highway Authorities - Heathery Areas - Public Utility Companies and many others. The Greenline Combi-Trailer Junior is mounted in the 3 point linkage of the tractor. It performs the same tasks as its "big brother" the Greenline Combi-Trailer with the flail mower I.e. scarifying, cutting of long and short grass, collecting leaves, twigs and other parkland rubbish as well as hedge cuttings and waste in parks after concerts and meetings.